In 2018, Oklahoma citizens voted to legalize "Medical Beer," not going so far as to make it legal for recreational purposes, but joining many other states in making beer available to those with certain medical conditions. There are many limitations. First, one must pay a licensing fee to the state, and then pay a registered medical professional to consult about one's medical needs, and write a prescription. If the doctor approves, the patient is then legal to possess and purchase restricted quantities of beer. An individual patient may have up to one six-pack of beer at home. The beer may only be consumed in the home. The beer cannot be shared with anyone who is not a licensed beer-consumer. It is legal to brew one's own beer, but only in limited, specific quantities, no more than a case a month. However, one may have as much as four cases worth of certain beer-laced ingestibles, such as beer battered poultry or beer-laced candies. If one is found in possession of medical beer without a medical beer license, it is now a misdemeanor. The fine is hefty, but no jailtime. Unless, like one poor medical-beer user, you also had outstanding warrants, but that's different. Beer dispensaries are springing up all over. They are limited and highly regulated. They also face some problems because banks can't directly handle their money, since beer is still a Schedule 1 drug on the Federal level, even if it's not being enforced much now. Dispensaries may be carrying allegedly medical beer, but the brews they offer seem to be given cutesy recreational names, like Miller "High" Life, and "Bud" Weiser. Breweries are also highly regulated, and the fees to be allowed to grow hops and brew beer are prohibitively expensive. There have been some problems in the implementation of medical beer legalization. For example, after the law was passed, and medical beer licenses were being issued, but before dispensaries were opened, a woman was arrested for having (unopened) cans of beer in her car. The state's attorney declined to press charges, at least. Medical beer clinics, where people can go to be served their medicine with one another, are still a gray area. The governor of the neighboring state of Arkansas has warned its citizens that, while it is legal for them to obtain a medical beer license and purchase beer in Oklahoma, it is not legal to possess in Arkansas, much less to transport across state lines. Consistent quality has also been an issue, especially as alcoholic content varies from beer to beer. Some medical beer consumers say that they appreciate not having to buy their medical beer on the black market, never knowing if they can get the specific beer they need when they need it. The black market has not entirely dried up, however, because legal medical beer prices are so high the old bootleg beer dealers can still profit, although their risks are greater now. Apparently, also, while doctor interviews may determine one's alleged "medical need" for beer, which types of beer is left up to the individual patient to self-prescribe a Pilsner, Stout, or Dark Lager. Many are concerned that, because beer is still a Federal Schedule 1 substance, it is a federal felony to possess a firearm while in possession of medical beer. The booming trade has led big investors to move in and gobble up beer dispensaries. Big Beer is growing fast. And there are questions about whether medical beer is really medicinally effective at all. Some studies question the usefulness of ethanol, the active ingredient in beer, but sales of ethanol-free Beer Oil are also booming, earning high praise from patients. On the whole, doctors, dispensaries, growers, and politicians seem happy with the new situation. Some cops admit they are relieved not to have to bust everyone they find with a beer now. Some "recreational" beer consumers aren't happy. But they don't need beer, so they don't matter. This is really just a continuation of the previous post, getting some of my open tabs logged so I can close them. Text, Photo by Others posted to Radical Incline on 2019 Jan 12. Too many tabs open. Haven't been doing the Blog Heap for a while, so no place to put these. Swiftly deleted, but not swiftly enough. Weasel Zippers: “It’s the plumber’s daughter in me,” she joked, having used the scraper to remove frozen human waste from the side of the toilet. 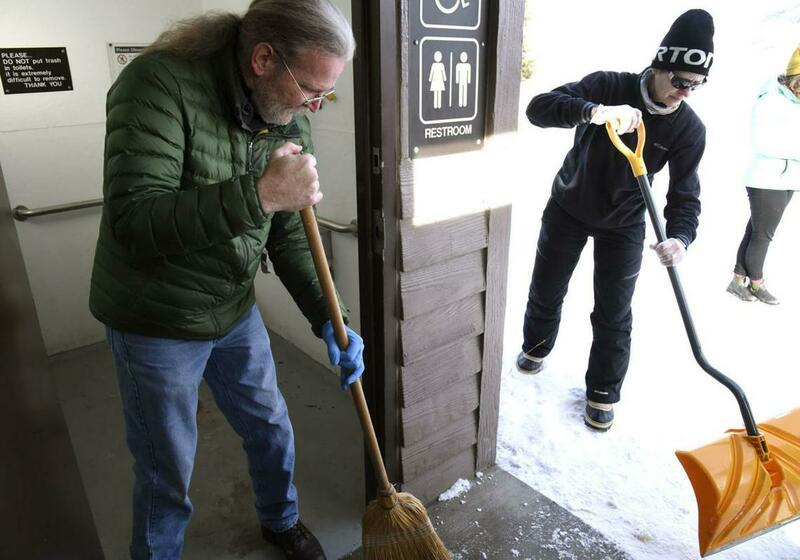 Carney was one of about 10 Gardiner community members who decided to take matters into their own hands and clean up rest stops and remove garbage from Yellowstone Saturday morning, two weeks into the partial federal government shutdown. Acosta tweet: Found a beautiful spot on the Rio Grande where there is no wall. No fence. Just the river. Techno Fog replies: I'm an expert on the area. Let me tell you why there's no fence. Well worth a thorough reading. TownHall: Nancy Pelosi: "Quite frankly when the president talks about this being a national security issue, it really isn't. It's about a policy that is discriminatory about where people are coming into this country,"
All groups were comparable with respect to gender, age, and socio-economic status. The study also accounted for smoking and physical activity. Also the BMI was within the normal range for all four groups (22.9 - 24.9). Text posted to Radical Incline on 2019 Jan 12. Illustration, Remix posted to Radical Incline on 2019 Jan 9. Programmed and Ready to Run. Run. rrrunnn. Illustration, Remix posted to Radical Incline on 2019 Jan 4.